SUBHEAD: As Uber launches self driving car in San Francisco incident causes DMV to shut it down. Image above: Still frame from dash camera video of Uber car blowing through red light in San Francisco in December 2016. From video below. In the video, a Volvo XC90 SUV decked out in the sensors Uber uses to see the world plowed through the intersection roughly three seconds after the light went red, and as a pedestrian was stepping into the crosswalk. Video above: The reality! 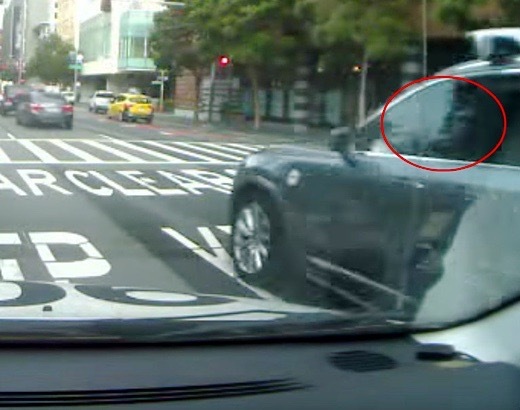 What appears to be an Uber driverless car blows through red light in San Francisico. From (https://youtu.be/_CdJ4oae8f4) and original article. Charles Rotter, operations manager at Luxor, confirmed to the Examiner that the video was from Wednesday. “Yes, the dashcam of one of our ramp vans at 10:37 this am,” he wrote, in an email. The cab pulls up to a red light on Third Street in South of Market, by the San Francisco Museum of Modern Art. A pack of cars flies through a yellow light, and one even drives through the first moment of a red light. About three seconds after the light turned red, an Uber self-driving car can apparently be seen traveling through the red light at moderate speed as a pedestrian walks across the intersection on the right side of the intersection. While the video does show an Uber vehicle driving through a red light, it is not clear whether the vehicle was self-driven at the time. The cameras at the top of the vehicle indicate that it is capable of operating without a driver, but such vehicles can still be driven by humans — and it is entirely possible that this video shows the result of human error. This incident was due to human error. This is why we believe so much in making the roads safer by building self-driving Ubers. This vehicle was not part of the pilot and was not carrying customers. The driver involved has been suspended while we continue to investigate. Video above: The smooze! A promotional spot introducing Uber's driverless program in San Francisico. From (https://youtu.be/OKJK3_XIGD4) and original article.. So far, twenty companies have reportedly obtained the permits to test autonomous cars on California roads.